Engr. Paul Finlay, visiting lecturer of the Civil Engineering Department with Dr. Andres Oreta as host delivered a lecture on Timber Design for the undergraduate 4th yr CIV students on Jan. 27, 2010 and a public lecture co-sponsored by PICE-Lungsod ng Maynila Chapter on "Climate Change and Landslides: The New Zealand Experience" on Jan 29, 2010. 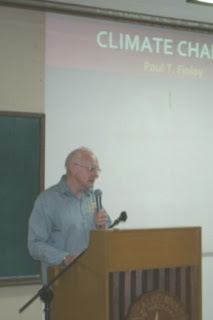 Paul Finlay, who was born in New Zealand, completed a B.E. degree under Professor Tom Paulay, and was selected to study at Kyoto Imperial University on a UNESCO Fellowship. He studied at the Earthquake Engineering laboratory in Kyoto Imperial Universtiy, and in the field near Kobe, particularly the Satsukiyama Faultline, a side fault of the Nojima fault, which ruptured in the Kobe Earthquake. This work was under Professor Hazuo Fujita – the ‘father of earthquake study in Japan”. He completed an M.E. degree at Auckland University, studying Earthquake Engineering, Structural Geology, and Slope Engineering. He completed a thesis on D.C. mV as a precursor to an Earthquake, testing the Chinese 1975 Haicheng Earthquake data and its practical application. He is pioneering in New Zealand, the relationship of dating landslides to simple rate of tree growth in determining the approximate date the landslide occurred in conjunction with known hurricane dates and the resultant frequency of failure of the land. He supports and applies the Australian Geomechanics Guidelines for Landslide Susceptibility, Hazard and Risk Zoning for Land Use Planning, and the New Zealand GNS Science Guideline for assessing planning policy and Consent requirements for Landslide prone land. He was involved in the West Coast Shakeout, the inaugural earthquake preparation for the coming M8 Alpine Fault earthquake. He hopes to interest and support Philippine Engineers to study this fault and ramifications in New Zealand, and apply for faultlines in the Philippines. Hello, Lasallian Alumni if your are interested to study in the Civil Engineering Master's Program of Chulalongkorn University, Bangkok, Thailand under the AUNSEEDNet scholarship, there will be an orientation tomorrow (January 12) at Miguel 104 (DLSU Campus) at around 2pm. 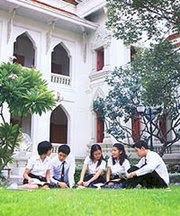 The monthly stipend if you are accepted for the June 2010 opening is around Baht 18,000 (Php25,000) for 24 months. Contact: Dr. Alexis Fillone (alexis.fillone@dlsu.edu.ph) for details.